Famed for its diamond mining, the Kimberley region is bordered on the west by the Indian Ocean, to the north by the Timor Sea, in the south by the Great Sandy Desert and the Pilbara. It shares an eastern border with the Northern Territory. The region’s biggest towns are Broome, Derby and Kununurra. 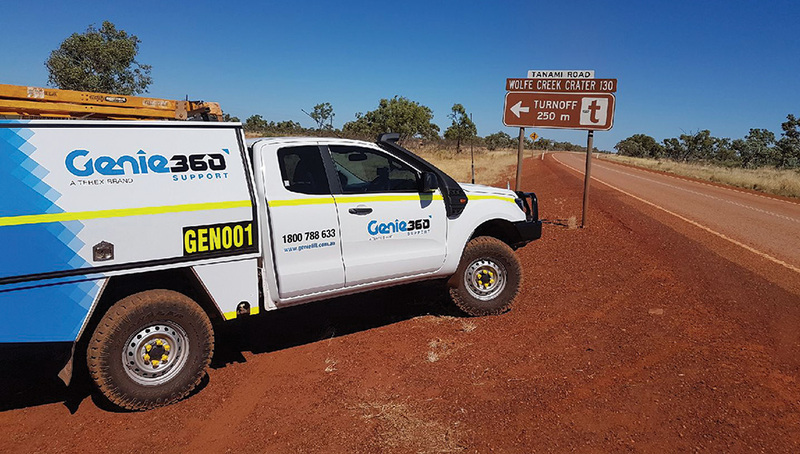 Rheece Mengler, a Genie Service Technician based in Karratha in the Pilbara, recently travelled the almost 900 km to Broome, and then to Kununurra, to connect in person with some of the firm’s northernmost Australian clients. “I oversee the Pilbara and the southern parts of the Kimberley,” said Mengler. The majority of the firms in the Kimberly hire small boom and scissors lifts. “Genie® GS™-1932 scissor lift, Z™-34/22 N articulated booms and GS-2669 RT scissor lifts are quite common in the Kimberley,” noted Mengler, who is an advocate of Genie 360 Support. Genie 360 Support reflects the AWP leader’s commitment to end-to-end customer service solutions. Genie 360 Support takes care of every aspect of customers’ AWP needs from initial sales and service through to technical support, operator training and even comprehensive management of an ageing fleet. “Many of the mining companies in the Kimberley and Pilbara prefer using new or near new machines; therefore, we talk to hire companies about the benefits of Genie 360 Support, and the value of trading in ageing machines for new stock,” said Mengler.